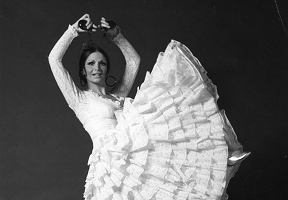 The Chicago dance community mourns the loss of legendary Dame Libby Komaiko, founder of the Ensemble Español Spanish Dance Theater, who died on Saturday, Feb. 2nd at Chicago’s Illinois Masonic Hospital from pneumonia, complicated by Lupus and Raynaud’s Syndrome. She was 69 years old. For over 50 years, Dame Libby Komaiko’s illustrious career embodied art, education, and cultural integrity. Born in Chicago June 30, 1949 and raised in Evanston, Ill., Komaiko started her dance training as a young girl, studying with Elisa Stigler at the Chicago Musical College of Roosevelt University. 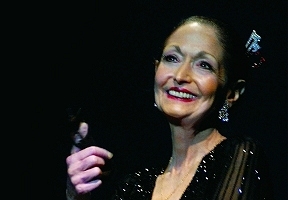 As a teen, she studied and performed jazz, modern and musical theater with the famed Gus Giordano. 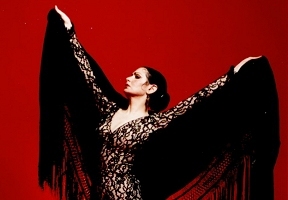 By age 18, she auditioned for the legendary Jose Greco, and was given the opportunity to train and perform with his world-famous Spanish Dance Company. In 1975, she founded the Ensemble Español —and what began as a company of seven student dancers, is now a full company of 40 dancers, musicians, singers. She choreographed and produced the majority of the company’s choreographies, which now number near 135 original works. Komaiko is survived by her sister Leah Komaiko, brothers Bill Komaiko and Dan Komaiko, birth daughter Jen Miller and birth granddaughter Amanda Miller. Community memorial services at Northeastern Illinois University will be announced at a later date. In lieu of flowers Dame Libby and the family‘s wishes are for donations to be made to the Ensemble Español Spanish Dance Theater, ensembleespanol.org/raised-chicago-ready-world/.